Short Story: Firewheels are definitely in full bloom along most roads that have any wildflowers. A super-bloom of mealy blue sage (https://www.wildflower.org/plants/result.php?id_plant=safa2) and four-nerved daisy (http://www.wildflower.org/plants/result.php?id_plant=TELIL) is in progress along sections of Texas 41 and FM-1340. Full Story: I decided to take a leisure afternoon drive out to Texas 41 to check on the mealy blue sage. I love the drive up there along Texas 16, Texas 173 and FM-1340. I also wanted to see if I could find some evidence to verify my working theory that the well below normal rainfall in October greatly impacted the annuals more than the perennials. There are a few locations here and there that got at least 1” of rainfall last October. Those locations seem to be doing better for annuals. The perennials seem to be doing much better and are benefitting more from the above normal rainfall that some areas received from November through February. Texas 41 between I-10 and US 83 got at least .5 to 1” of rainfall in October, well above normal rainfall for November and December and close to or at normal rainfall for January and February. 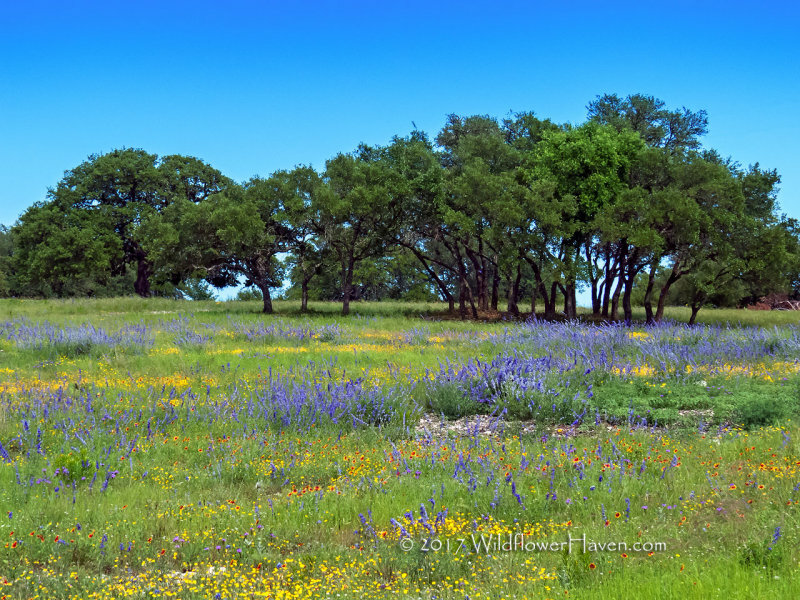 Based on what I saw Monday, it certainly looks like that the mealy sage, firewheels and the four-nerve daisies are having a super-bloom along Texas 41. I saw several large fields painted with long strips of blue, yellow and some red. However, along RR-479 north of US 290 there is much less diversity with only the mealy blue sage doing well this year. This does not take away from the awesome display of color along Texas 41. I saw a variety of wildflowers in bloom including pink evening primrose, yellow prickly pear cactus, blue curls, wine cups, Engelmann daisies, as well as the mealy blue sage, firewheels and four-nerve daisies. The mealy blue sage is in full bloom, but should still be good for the next week or so. All areas still look green, but it would not hurt for us to get a bit more rain which we might get Sunday. Texas 16: Good stands of firewheels in the median of Texas 16 before the intersection with Texas 46. 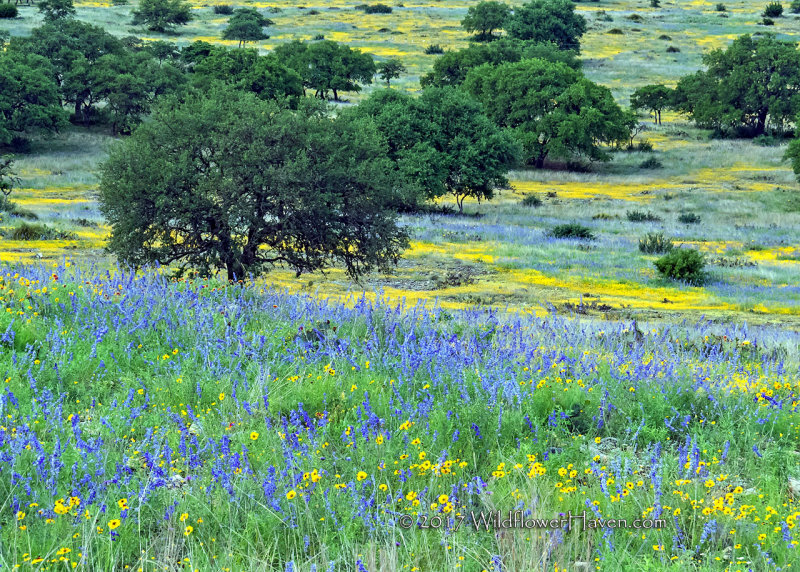 Texas 41: There are numerous sections along this route about 3 to 5 miles east and west of the intersection with FM-1340 that are experiencing a super-bloom of mealy blue sage mixed with the yellow of four-nerve daisies. Several long stretches of solid firewheels sometimes mixed in with pink evening primrose or Engelmann daisies. FM-1340: Before and after the entrance to Kerr Wildlife Management area there are large solid stands firewheels mixed with a few other wildflowers along the roadsides of FM-1340. Further down FM-1340 towards Texas 41, there are several nice fields of mealy blue sage mixed with four-nerve daisies. RR-479: North of US 290 along 479 there are a few nice fields of mealy blue sage. But unlike Texas 41 there is not much else mixed in with the mealy blue sage. Texas 173: Some mealy sage in fields along this route with some yellow possibly from the four-nerve daisy or some other wildflower. 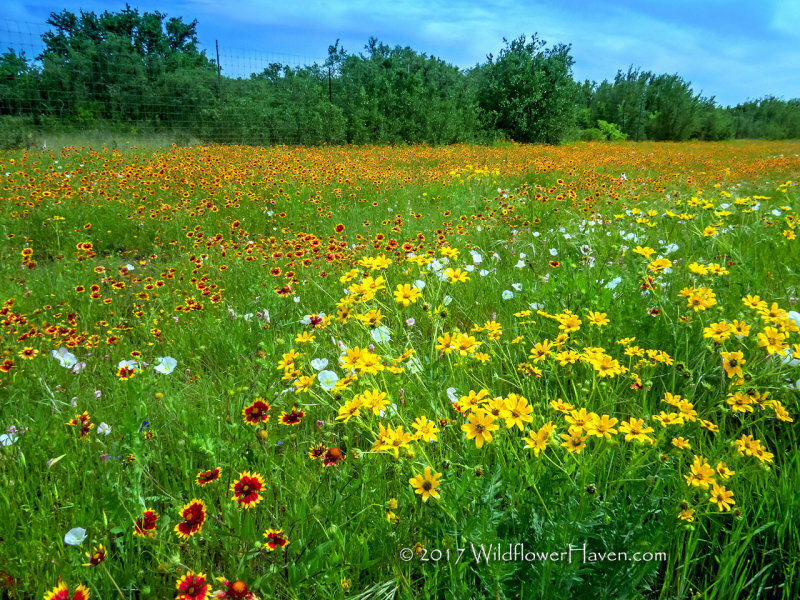 I-10: From Texas 41 to Boerne, there are several really dense displays of Engelmann daisy and firewheels. More Images: Wide and Panorama shots taken with smartphone camera to help give an idea of what you might find out along Texas 41. These are low quality images, so you will likely get better results with your DSLR.